My most recent project is an OM style six string. The guitar is going to be a gift from a Dad to his very special daughter, Mary Louise Brumit. Hopefully I’ll have it done by the time she graduates from College as it is supposed to be a graduation present. 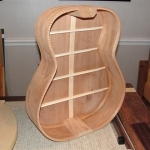 Mary Louise selected a very nice piece of ribbon mahogany for the body and lutz spruce for the top. The neck will be mahogany with a width of 1 11/16” at the nut in order to accommodate her small hands. The guitar will be bound with cocobolo wood and Brazilian rosewood will be used for the fret board and bridge giving it a special touch. Mary Louise is studying the Arts in college and will be designing her own inlay theme. I can’t wait to see what she comes up with. View the pics from this recent project.